This is a beautiful cluster row of round cut diamonds. This intricate design has diamonds going around the entire ring, which really makes for a showstopper piece. Each stone is set it in a beautiful prong setting and tied together in a platinum band. This design will give off a brilliant sparkle no matter the angle. A stunning classic. This beautiful ring features a glittering princess cut diamond. 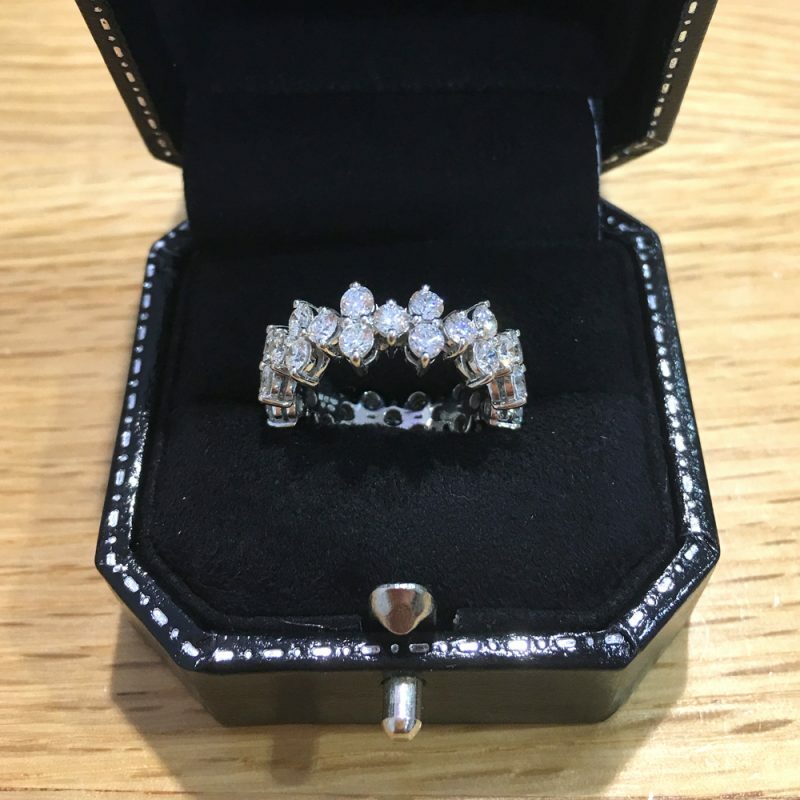 Secured with four prongs at each corner and finished off with a platinum band, this jewellery piece would make for a wonderful engagement ring. We don’t just create rings, but also other wonderful pieces of jewellery, such as these diamond cluster earrings. This pair of earrings contains a superb collection of diamonds that are held together in a gold loop. The gold provides an excellent contrast to the diamonds and really make them stand out. A beautiful accessory, this will add sparkle to any outfit. So those were just a few of our fantastic pieces. If you have any questions on any of the jewellery featured, don’t hesitate to get in touch! We have helpful and knowledgeable staff that will be happy to answer any enquiries you may have. We also offer a bespoke jewellery design service, so if you like any of the designs, you can reference this and we can craft one in our on-site workshops. Just contact us using the contact form below, telephoning or by visiting one of stores in Hatton Garden.